The play is uninspiring, the rookie quarterback is bland, the offensive weapons are scarce and not only does the head coach lose, but his monotone press conferences would put most folks to sleep. After their Week 1 win in Detroit, they were one of the most buzz-worthy teams around. Even in defeat Week 3 in Cleveland, they played exciting football. Sunday in Chicago was a snooze-fest. Blame injuries, blame pre-snap penalties, blame whatever or whomever you want. But it's time to lay most of this on Todd Bowles. He's a fine players' coach, and a football lifer who seems like a man of sound integrity. But his teams just don't have any moxie. Somehow, he was proud of his team after Sunday's performance. "This is one of the first game the entire year we've stayed together and fought, collectively," he said after the game. "Execution was not great, obviously, and we've got to make more plays, and we know that." He's probably referring to not coming apart at the seams due to a rash of injuries. Jamal Adams can talk with the best of them in the NFL, the secondary can come up with catchy nicknames, they can continuously drone on about how "they're close" to being a good team. They're going to miss the playoffs for the eighth straight season, and after Sunday's 24-10 loss to the Bears, they have won only two road games in their last 13. They are 3-5 going into a three-game stretch against division opponents that will likely determine if Bowles continues with the team. He is signed through 2020, but the team could buy him out. If the Jets lose to the Dolphins this week and at home against the Bills next, expect him to be fired during their Week 11 bye. Bowles offered this response in his weekly conference call on Monday when asked why the Jets weren't making enough plays: "There's nothing you can do, we're working hard at them. We make them in practice, we just got to carry them over to the game." Is that a shot at GM Mike Maccagnan for not getting him the personnel necessary to win? Six of the Jets' eight accepted penalties Sunday were false starts -- and that speaks to preparation and coaching, since the players just couldn't seem to be bothered to remember the snap count. If the Jets don't clean things up in a hurry, they'll start cleaning house instead. --QB Sam Darnold, who is tied for the league lead with 10 interceptions, didn't turn the ball over Sunday for only the second time in eight games. But he has completed less than 50 percent of his passes three of the last four weeks. In the other game, he completed 80 percent in a win over the Colts. --WR Deontay Burnett, Sam Darnold's teammate at USC, led the Jets with four catches for 61 yards on Sunday. 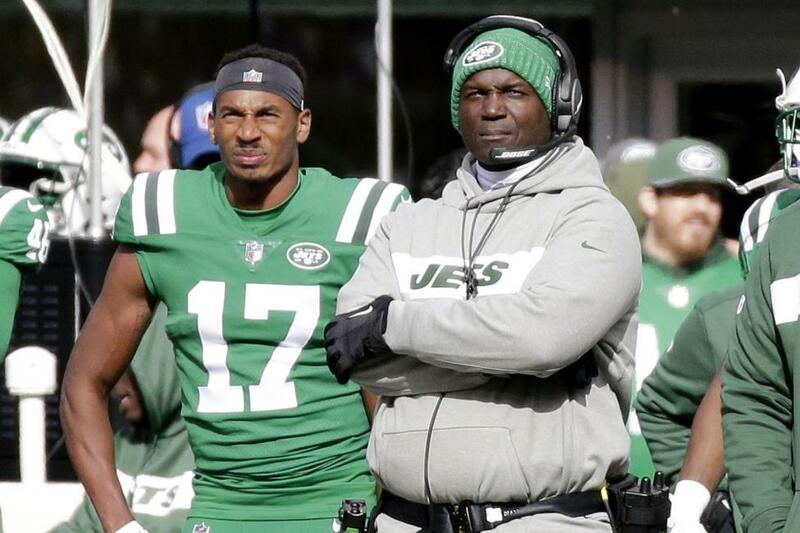 The Jets have had a different leading receiver each of the last four weeks -- Robby Anderson, Jermaine Kearse, Trenton Cannon and now Burnett -- after the injured Quincy Enunwa led them each of the first four weeks. --KR Andre Roberts, who leads the league with 253 punt-return yards, had only one return for eight yards Sunday. --K Jason Myers has made all nine of his field goals and all six of his extra-points the last three weeks. --OLB Brandon Copeland had a sack for the second straight week.